We have just passed our anniversary in September and are approaching the end of the calendar year. On Thanksgiving Day, it is good to pause to reflect on our blessings, so here are a few random reflections. We have made it with a couple serious illnesses at the children’s home, but no deaths since Jun passed away two years ago. For that we give thanks. The children have had a hot meal every day. It hasn’t been a wide variety or quantity but they have never made a complaint. We have been able to get medicine for the most serious health needs and for some of the less serious problems. Funds came in to allow us to update the septic tank so that we could continue to operate. The children have continued to excel in school. The older ones help the younger ones with their schooling and challenge each other to do their best. 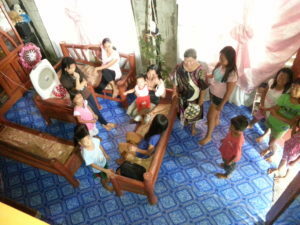 The volunteers continue to help Inday with the work which takes some of the load off her. One of our longtime regular supporters passed away this past year and we are sad for that but she is no longer suffering and we were blessed to know her for these many years. Things are getting worked out with the school so that when we have funding it will be able to open. It will be a blessing helping train the youth and adults in occupations that will help keep the family units intact. As you can see, we have much to be thankful for and give thanks to our Father in heaven for all these blessings.